We often have rotating displays throughout the library. Be on watch for our next display. The Redding Library was built with generous support from the community. These two panels honor the donors who contributed money towards the new library. The left panel honors the New Library Now donors, and the right panel honors the Shasta Library Foundation donors. A beautiful life size-bronze statue of Mark Twain by Sculptor Gary Lee Price. In this piece the sculptor says he attempts to create a narrative piece that depicts Mark Twain's inspirational touch in bringing to life Tom Sawyer. Creating a playful connection and appreciation between the author and his characters. Initiated as a fundraiser, the Giving Tree helped raise over $100,000 towards building the new Redding Library. Engraved on each leaf, stepping stone and foundation stone are names and personal messages. In the Redding Library, we have two beautiful model ships donated by Captain Peter Wright. Captain Wright completed twenty-two years in the British Merchant Navy as mate and master. In 1965, he came to the United States and eventually moved to Northern California where he wrote two biographies, both available here at the library. 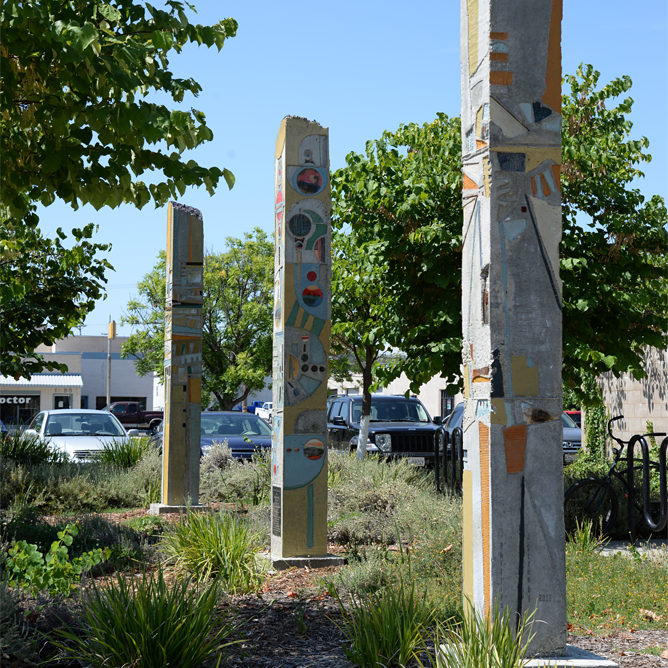 Located just west of the main library entrance, the title of these 12 foot monolithic concrete sculptures, which was added to the Library grounds in 2013, refers to the small red glass tiles forming focal points in the work. It incorporates the idea that one of the functions of a library in the community is to give its users a starting point to develop their ideas, interests, plans and dreams. Based on the concept of one form folding into another form in a continuous sequence. The forms are folded into a variety of planes and angles, each maintaining its own structural identity as it becomes an integral part of a new entity. 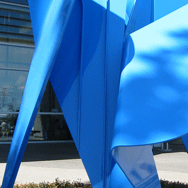 The 10 foot tall, abstract folded-metal piece is from artist Bill Mueller's "Synergy Series."